1. Is there a backline for this showcase? Yes, there is a basic backline. Full drum kit with cymbals (however you may bring your own cymbals, snare, etc), 2 guitar amps, 1 bass amp. 3DIs 3 Vocal Mics and Stands. The drums have mics as well. Monitor and Main mixes are separate. 3 stage monitors one for drums. And a very patient sound guy, please be nice to our crew they want to help you make this a fun and successful event. The backline is on the big stage only. Fireplace stage is for solo and duo acts. Update!, no stage 2 this year due to construction, please be mindful of parking and load in. Communicate with the stage manager if you have any parking issues. 2. Is there any compensation for this gig? We will feed you, ask the general manager of the event that day and they will give you a coupon good for food and drink. 3. Is there a merch table? Yes! Please bring your merch and a person to work the table you keep 100% of what you make. 4. How soon should I be there? At least 30 min before you go on stage would be preferable, and hour at most, but please come and support the other artists if you have time. Also this is a good time to check in with the stage manager and sound guy if you have any special sound requests. Try your best to tune before you get on stage. There is some room by the sound board and merch table for cases but not a whole bunch so try to keep your gear cases to a minimum. We have band parking right behind the stage, but don’t stay there all day as the next group will also need to unload, once you’ve unloaded please find another spot to park. There is a garage behind the venue and the artist are more then welcome to park there. If you need a garage parking pass please see our crew. 4a. I have a stage plot can I send it to you? Yes the more prepared we are for you the better you will sound and the smoother this will go. Please bring a copy day of for the sound guy and stage manager and we will do our best to setup for you/with you. We use www.stageplot.com for our setup. 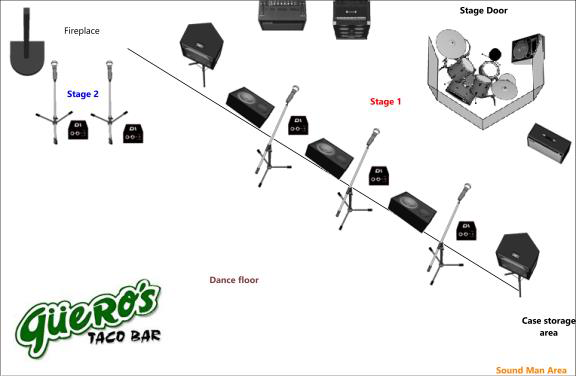 Below is copy of our stage plot. 5. Can I play other showcases that day? 6. Is this an official showcase? No, this is an offshoot and it’s own event during SX. No wristband required, keep in mind the beer garden does have limited standing room which is monitored by the gate person. There are years we have had to turn people away as the garden was “full”. Please be sure your fans get there early for a good spot under the oak tree. Could be cold, rainy, or warm and beautiful. Austin varies, please check local weather listings. We won’t cancel unless there is a downpour. The stage is covered so don’t sweat it. Please drop us an email if you are concerned about the weather and dress appropriately for the weather at this event. It seems to vary year to year. We use the Dark Sky app day of to check weather. 8. Was this the venue I saw in the movie Chef?